A1059 - M9268LL. 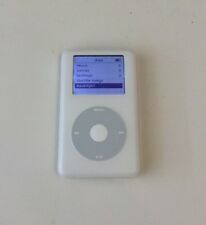 APPLE IPOD CLASSIC 4TH GENERATION - 40GB - WHITE. We will do our best to make it right! 100% tested, fully functional. Physical Condition: 8/10. Our warranty covers manufacturer defect ONLY. 120mAh Battery Upgrade + Wolfson DAC + 60 Day Warranty! IPod 4th generation (20GB) loaded with 3695 songs. (This item is used. It has been tested and is working. Power adapter is NOT included. Item may have scratches, scuffs, or other signs of wear due to previous use and handling. No warranty on used batteries even if dead.). APPLE IPOD CLASSIC 4TH GENERATION - 30GB - WHITE. Used, 100% tested, fully functional. We will do our best to make it right! Physical Condition: 7.5/10. 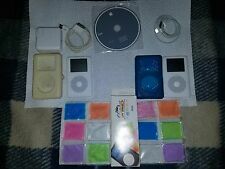 Used (Original Owner) Apple IPOD 20GB Model A1059 Bundle. Each include a USB to Ipod connector, Protective Case (White Glows in the dark), 6 Protective Screen Shields. Screens have no major scuffs, the rear of Ipods only have scuffs from keeping the case on and using the belt holster. A1059 M9282LL. APPLE IPOD CLASSIC 4TH GENERATION - 20GB - WHITE. iPod and charging cable ONLY (what you see in pictures). Make sure to use a good wall charging cube adapter for charging. I am reasonable and will work with you. 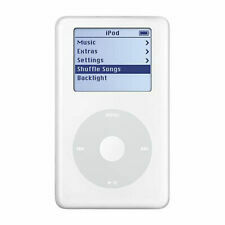 Hello, I have a Apple iPod Classic 4th Generation White (20 GB) A1059 M9282LL-LOCKED., see pictures. Was never used or loaded. This was a gift and was never used. The original box has a little wear from storage, but is in good overall condition with one small tear. 20GB 4th Generation. Used 20gb iPod 4th generation. Used but in great working order. When plugged in everything lights up. Can provide I picture of that if needed. 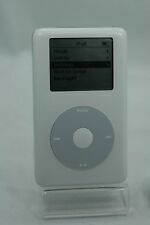 This is a White Apple iPod Classic 4th Generation 40gb. This iPod has been fully tested and is working great. The battery was just replaced, it now gets about 9-12 hours battery life. It is used and shows average wear, but nothing major. Trending at $68.82eBay determines this price through a machine learned model of the product's sale prices within the last 90 days. We have many cool products from housewares to automotive and power tools at great prices. This is a White Apple iPod Classic 4th Generation 20gb. This iPod has been fully tested and is working great. The battery was just replaced, it now gets about 9-12 hours battery life.It is used and shows average wear, but nothing major. Apple iPod classic 4th Generation White (40 GB) A1059 - Good Condition. Includes cord Working condition and fully functional. It is loaded with songs. An item that has been used previously. The iPod was loaded with musics from previous user and not formatted. 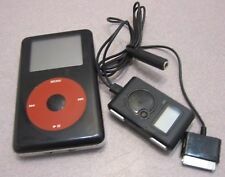 This is a U2 Special Edition Black/Red Apple iPod Classic 4th Generation 20gb. Have an old unused iPod laying around?. Or extra parts leftover after a repair?. This iPod has been fully tested and works great. Cellophane around box was opened to check contents, however MP3 Player was NEVER touched physically or used. NEVER taken out of its original cellophane wrapping. I had to open the box because I had to take photos of the unit and make sure everything was inside even though I already knew everything was inside. Sound out both channels. Usual wear and scratches for an iPod of this age. iPod is full of music! Item for sale: Apple iPod Classic 4th Generation White (20 GB) A1059 - Good Battery. Battery holds a charge for up to two days. Check my other listings. Shipping: Usually first class mail (2-3 Day time frame) - I will gladly combine shipping. Payment: This is a PayPal auction. I place a high value on all customers. I pride myself on fast shipping, quality merchandise, and customer service. Positive Feedback is appreciated. Ships with delivery confirmation. That number will be uploaded so the item’s whereabouts are never a mystery. Apple iPod Classic 4th Gen A1059 White 20GB Tested, Works! Mode: A1059. Capacity: 20GB. Apple iPod Classic 4th Generation. Battery tested and played for 12 Hours. Includes iPod only, no wires/ accessories are included. Tested, Works! 5 out of 5 stars - Apple iPod Classic 4th Gen A1059 White 20GB Tested, Works! 5 product ratings5 product ratings - Apple iPod Classic 4th Gen A1059 White 20GB Tested, Works! 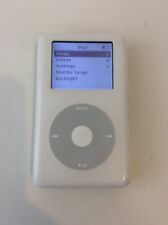 Apple iPod Classic 4th Gen A1059 White 40GB Tested Working This item has been fully tested and is in great working order. Apple iPod 4th Generation Logic Board [820-1535 / 820-1723-A]. Up for sale is (1) logic board for the Fourth Gen Apple iPod. This board features the highly prized Wolfson DAC sound chip which is responsible for AMAZING sound quality. White classic ipod. 20gb.good condition. Hours: We are available Mon to Sat 9 am to 6 pm. Lot of two ONLY. NO OTHER accessories/parts. SCRATCHES/SCUFF MARKS. They are cleaned and presented for sale in the State. WAS CLEANED AND TESTED WORKS 100%. ALL HAVE NORMAL WEAR AND TEAR. Condition is For parts or not working. Can’tg et iPod to g et p as t th is s cr ee n it i s on. Fo r pa rt s or r ep ai r. Sold as i s.
DETECTED ISSUES: WON'T BOOT PAST APPLE LOGO!